Records that have a concept behind them, whether musical or poetic in nature, tend to be sprawling, drawn out affairs that have a hard time remaining contained in the space afforded to them, no matter the size. While this can be said of Protovulcan’s Life is Twigs/Psychic Pinball, it shouldn’t be said without asterisking that for as over the top-jarring as this extended play is, the band couldn’t have rendered much more endearing charm of its brooding, experimental content if they tried. Life is Twigs/Psychic Pinball is really two smaller EPs mashed into a single disc, and each show off a different angle of the band’s incredibly volatile brand of noise music, which often flirts with melodious rock n’ roll rhythms against a textured backdrop of feedback, controlled chaos and bombastic beats. We start off with Life is Twigs and the affectionate “Pine for You,” which ungracefully sets the tone for the adventure we’re embarking on. “The Force Remains the Same” follows up with a pendulous, “No Quarter”-style dissonance that slowly evolves into a crushing harmony under the command of a grizzly bassline. “Snake Legend” tediously concludes Life is Twigs on an ominous, somewhat dooming note that isn’t carried over into the freewheeling “Soma Sutra,” which rattles and writhes at the direction of a twisted old world circus-like groove. 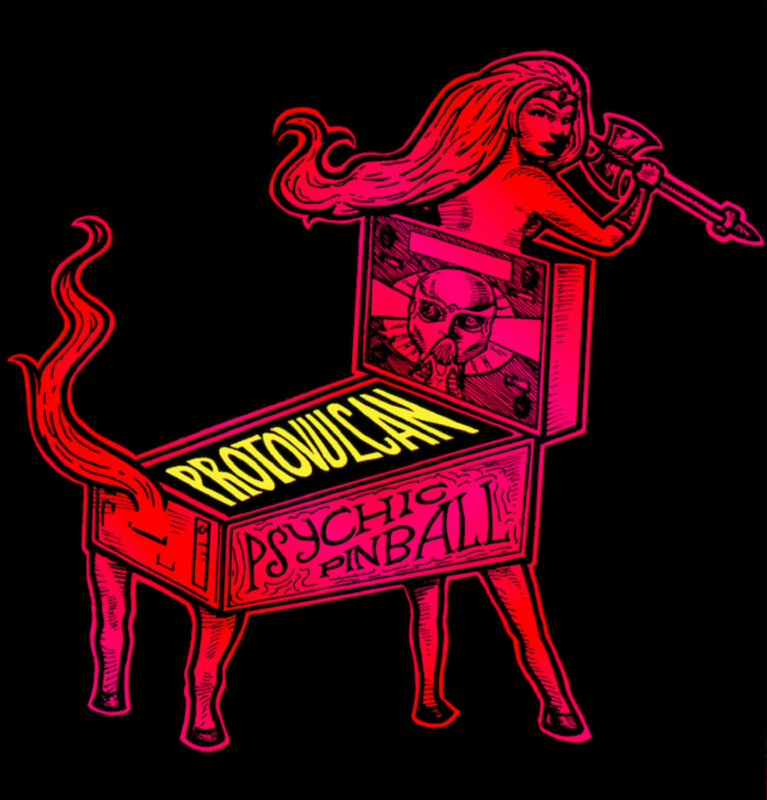 Psychic Pinball, as its name would suggest, is like a divine game of chance that we become strapped down beside and given no choice but to bear witness to. A coupling of included remixes for “Purple Sky” and “Celestial Slingshot” offer up an electronic-tinged take on two of Life is Twigs/Psychic Pinball’s most intriguingly composed numbers, but I truly feel that they stand in the shadows of their original mixes, which are menacing and create a bleakness that is, for whatever reason, spellbinding from the very moment that it comes into focus. Nothing about this extended play falls in with what I was anticipating out of its tracks, which were advertised to me as being extreme but not as inventive or happily “outsider” as early stuff by The Velvet Underground was. I beg to differ on multiple counts; one, this lives up to the high standards set by the Velvets so long ago, and two, to say that these guys aren’t embracing their eccentric image would be absurdly inaccurate. After all, their music wouldn’t come off as confidently and seamlessly if they weren’t. Life is Twigs/Psychic Pinball is, at its core, experimental sounds compiled together exclusively for the discriminating music buff among us who isn’t amused by the comical attempts at relevancy that are often given credence by the national media and international music-oriented television outlets. Protovulcan strike me as a band that has no problem standing on the outside looking in and making music that doesn’t fit into the pre-designed categories that help us to determine which payola-backed singer/songwriter will win what Grammy this year. This release is a respectable, original, unvarnished stab at enriching tone and music theory through the power of creative thinking alone, and if that isn’t inspiring in these electronically-faceted recording times we’re living in now, I don’t know what is.